This is a free download of 8 end of chapter worksheets for the first 8 chapters of the book Billionaire Boy by David Walliams. These are short quick exercises which ask the children to recap the chapter, look up difficult words in the chapter and then to answer a few question about the chapter they have just read. 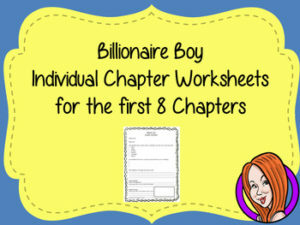 These worksheets are taken from my Billionaire Boy Book series which has 26 individual lessons each including lesson plan, explanation PowerPoints, class activities and copies of these end of chapter worksheets.